On the face of widened spot discounts on Thursday, June 28, traders in the east China aluminium market showed keen interests in purchasing cargoes, according to Shanghai Metals Market. Such high buying interests also spurred trading liquidity. Producers in east China showed interests to offload cargoes for repaying loan interest towards the mid-year while downstream consumption was relatively weak. This widened the spot discounts. In Shanghai, the transactions were done at RMB 14010 per tonne to RMB 14040 per tonne, with spot discounts settled at RMB 90 per tonne to RMB 80 per tonne against the SHFE 1807 contract. The discounts were about RMB 80 to RMB 70 per tonne a day earlier. Transactions in Wuxi and Hangzhou, on the other hand, were heard at RMB 14010 per tonne to RMB 14040 per tonne and RMB 14030 per tonne to RMB 14060 per tonne, respectively. Trading in Guangzhou stood thin as buyers there did not actively participate in purchasing cargoes due to cash woes, while transactions in Guangdong were mostly done at RMB 14100 per tonne to RMB 14130 per tonne, with Guangdong-Shanghai price spread narrower at RMB 100 per tonne. However, despite active trading in the east China aluminium market yesterday, A00 aluminium ingot spot price in Wuxi and Jiangsu dwindled today from RMB 14025 per tonne to RMB 14000 per tonne, with the expected average price ranging between RMB 13990 per tonne and RMB 14010 per tonne. 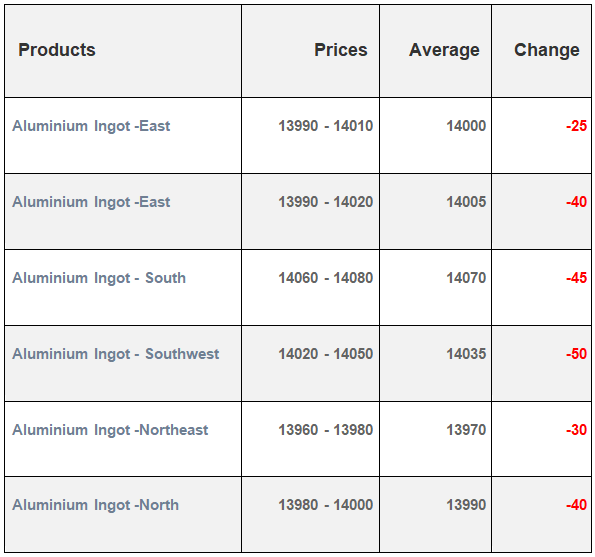 South and North China also witnessed aluminium ingot price fall from RMB 14115 per tonne to RMB 14070 per tonne and from RMB 14030 per tonne to RMB 13990 per tonne, respectively. The average A00 aluminium ingot spot price also dwindled today from RMB 14030 per tonne to RMB 13980 per tonne after rising last two days in a row. The spot discounts are expected to settle at RMB 90 per tonne to RMB 50 per tonne.